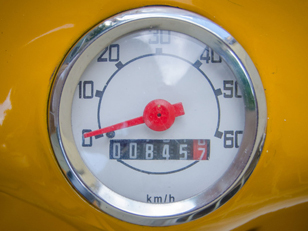 Riding a motorbike in the city can save you time and money, something everybody would like to do. According to an RAC survey, commuters could save three hours a week on their commuting time if they were to opt for two wheels rather than four. There are also parking advantages and congestion charge exemption (for now) to add to the long list of advantages a motorbike has over a car. As a result, commuting by motorbike makes sense but city riding can be difficult and sometimes a little scary, particularly during rush hour. That’s why we’ve cobbled together a range of tips to keep you safe in city traffic. Speed is one thing that you’re in control of when you’re riding so make sure you make it work to your advantage. In the city, you’re not going to be able to open your bike out however there are some occasions when a gap may open up and the temptation is to move into that space quickly, before somebody else does. The chances are however that if you’ve seen it, somebody else has and in a fight between a car and a motorbike, there’s only ever one winner. So if you see a gap, move into it carefully and slowly. This gives you time to respond to anyone else who might have the same idea. Filtering is what sets motorbikes apart from cars and what claws back most time on journeys. It’s also one of the more dangerous aspects of riding if it isn’t done properly, with due care and attention. When filtering you should only do so when traffic is stationary or moving slowly. You too should not filter past traffic at too high a speed. Instead, you should only filter when traffic is settled and at a slow speed. Again, this slow speed gives you more chance to react to any hazards, lane-changers or doors opening. Because you’re riding a motorbike on your commute, filtering will probably be something you do frequently to save time. However it’s important to know when this is more dangerous and when caution is advised. The above outlines exactly when you should be weary about filtering because these are the occasions when other road users will be most impatient and most likely to change direction. 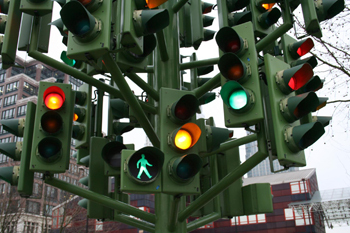 At traffic lights, a green light can sometimes remind road users of the start of a race and it’s also where most lane changes will take place. And that applies to anywhere that vehicles are required to slow down. When riding you should always expect the worst from other road users. If you leave yourself enough room to cope with the worst-case scenario then hopefully you’ll avoid it and, similarly, if any other scenario occurs instead, you’ll have more than enough space and time to deal with them, too. Where possible, avoid the gutter. While it may seem like the line of least resistance – which is what every road user is looking for – more often than not it isn’t. Gutters have grids, house cycle lanes and bus stops, and are used by cars and other road users if there isn’t enough room on their outside. That means the gutter is a recipe for disaster, even before you throw impatient pedestrians, car doors opening and other vehicles turning into the mix. 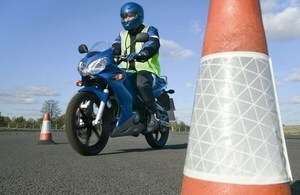 Always try to ride on the outside of traffic when overtaking or filtering – there will be more room there. As ever, it’s important to look for pointers from other road users in order to spot hazards as early as possible. Look out for indicators, front wheels pointing left or right and brake lights being applied. While this sounds ridiculously obvious, when traffic is at close quarters it’s sometimes easy to forget to look at each car individually – if you’re travelling at a safe speed and have given yourself enough room, you will be able to cope with these hazards. Everyone should use their indicators and most people do, particularly in heavy traffic, and so should you. Signal early and give other road users the time to see your intentions however, almost as important, remember to cancel your indicators. If your indicator is flashing on the approach to a junction, you’re asking for other road users to pull out in front of you as they look for a break in traffic and presume you mean to do what you say you’re going to. If you’re not using it, cancel it. Gaps in traffic will develop and it’s not up to you to force them by riding aggressively or on the bumper of other road users. By riding in a relaxed manner and moving into spaces slowly and safely when they appear, you’ll still save time. Riding manically into gaps will as often as not box you in and slow you down, as well as put yourself in danger and antagonise other road users. In heavy traffic, headlights, tyres and vehicles can blend into one – your clothing is one thing that will set you apart. Wear reflective clothing and make yourself as visible as possible. Remember – by commuting on a motorbike, you’re saving yourself time – as much as six and a half days every year. Feel smug but ride safe. Images courtesy of Jerzy Kociatkiweicz and .Martin. via Creative Commons. Some images may have been adapted.